My husband decided early this morning that he must drive back to our home town to protect our house there during Hurricane Sandy. I said, “No way!” and now he’s fuming mad at me. The thing is, I’m not sure there is much he can do. If a tree crashes through our roof or a window, and flooding commences, what then? We don’t have plywood sheets or the tools to secure the house. “I can use a tarp!” he said, but a tarp isn’t going to hold up in 80mph winds. “I can call a contractor!” he said. But any and every contractor is going to have a very, very long waiting list. A roofer? Forget it. “But if I don’t go now, then it will be an extra two days at least before I can get there because we’ll have to deal with the storm’s wake up here, and driving will be difficult.” That is true. And it may be impossible to get enough gasoline along the route – service stations are already crowded with people filling up before the storm. Water, flashlights and batteries are already stripped from the stores from Virginia to Massachusetts, as is most non-perishable food – – our son posted a picture of our hometown’s local supermarket on his Facebook page showing the shelves completely bare. They’re closing bridges tonight . . . for who knows how long. Frankly, besides the damage, I am concerned about looters. But I also don’t feel particularly good about him defending our house solo, even if he’s armed. The point is, there is no “good” outcome here, and we just have to daven that HaShem will help us and keep our children and grandchildren safe, along with their homes and ours. It’s really, really tough and scary to not be in control. And that is what things like this force us to see: we can’t always be in control, and beyond our basic human efforts of hishtadlus, we have to daven and leave it up to HaShem. Do you think I’m being naive or callous or cold-hearted? Let me know your thoughts. Let’s hope that terrible times will bring out the best in people, and not the worst. Now that is something that is in each individual’s power. Viewing or spending time in nature has been shown in numerous studies to alter people’s physical and emotional response to stress. A review of 120 studies published in 2009 in the International Journal of Public Health found that time spent in parks, gardens, or waterfront or wilderness settings was associated with more positive feelings, lower pulse rates, and other markers of well-being. Researches have long known that mood and anxiety disorders are more common among city dwellers. A brain-imaging study last year in Nature suggested that living close to nature alters the brain’s response to stressful challenges. When compared with people who live in rural settings, city-dwellers subjected to stress show more activation of the amygdala, which processes emotions. People who have been raised in cities also show greater activation of the cingulate cortex, which helps regulate the amygdala and process emotions, compared with participants raised in the country. In a 2o1o study by Japanese researchers, subjects who walked through a forest posted lower blood pressure, pulse rate and stress-hormone levels than those who toured a city. Researchers believe nature offers pleasant, refreshing stimuli that help people find meaning or a sense of identity, without imposing stressful challenges or distractions. 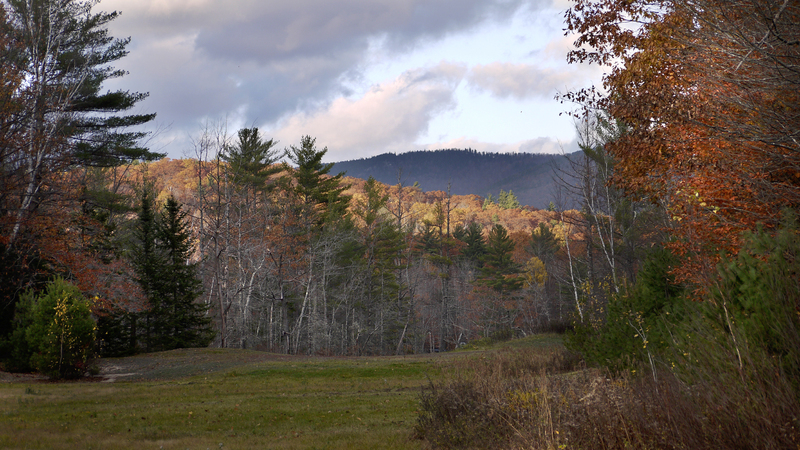 Even though we missed “peak” foliage season (by the time we got back to Maine after the Jewish holidays, the reds were long gone and now we’re down to a few golds but mostly browns), there is still much beauty all around. Yesterday I started walking my daily 2-mile loop and for some reason, I decided to turn down a leafy path I had never before visited. It led to an area that held many surprises: magnificent mountain views, evidence of summer bear activity, and a rushing offshoot of the Cold Brook River. Starting next week I will have to wear my blaze orange vest so the hunters won’t mistake me for a deer, but meanwhile, all is quiet and peaceful. The beauty here never ceases to amaze me and fill me with wonder. Sometimes, even shifting as little as 3′ provides a completely different perspective and view, which of course is also affected by light patterns, weather, and the seasonal changes. It’s great to look at the same thing but see something new and different each time. 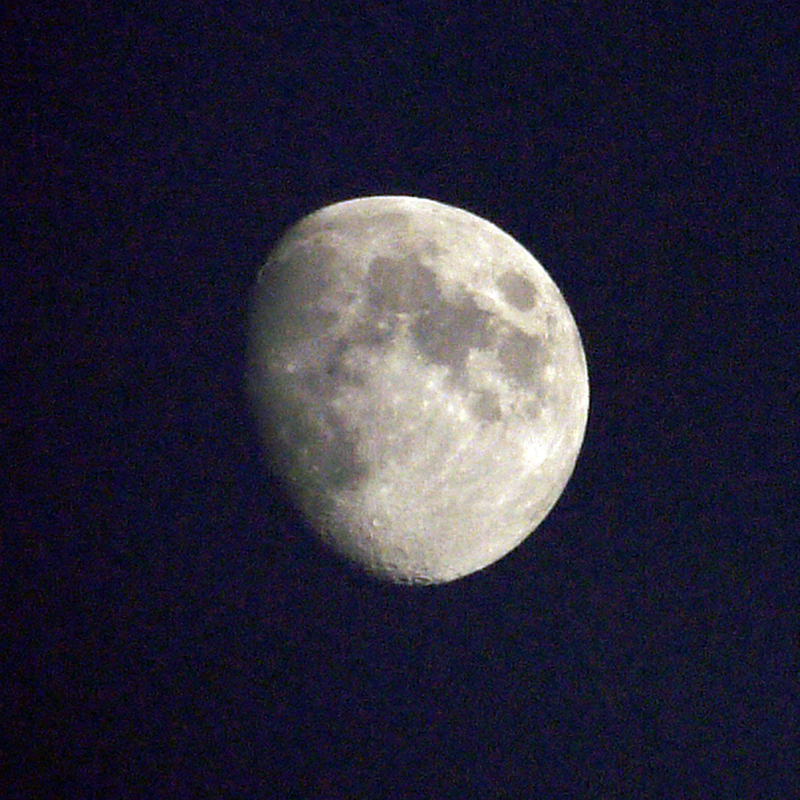 Enthralled by yesterday’s views, I encouraged my husband to join me the following day, and this time I brought my tripod and 2 lenses so I could get an even more beautiful shot. Alas, the overnight winds had thinned the trees, and the color of the leaves that were left had greatly faded. So here’s a little mussar lesson: there might be another opportunity tomorrow, or the next season, or the next year . . . but there might not. We don’t necessarily get second chances. So appreciate the day that you are given, embrace it, and give thanks to G-d.
Today I did something really fun: I went to a tai chi class! This gentle form of exercise was recommended to me for my osteoporosis, as it helps balance, posture, and can prevent falls. 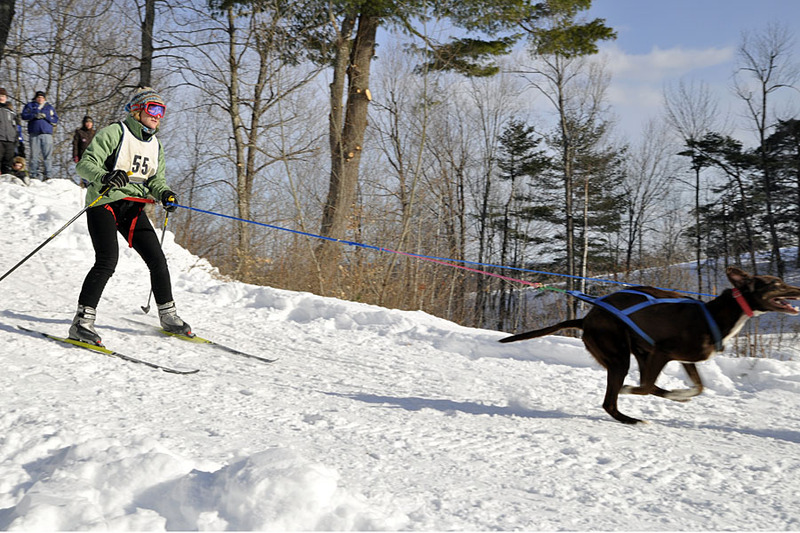 It was held the next town over, sponsored by the recreation department, and was completely free of charge. In the summer it’s held in the park, but now that temperatures are cooler it’s held in the town’s basketball gym. Forty-two people (including the instructor) showed up, and other than one 30 year-old woman, I was the youngest one there! Imagine 40 people between the ages of 60-80 moving silently and gracefully with great balance and coordination. It was an interesting mix of people, including preppy-looking WASPs who looked as though they had stepped right out of an LLBean catalog, as well as many old, tough “Mainuhs” who in their younger days might have considered tai chi “weird” or “for sissies.” But several of the attendees simply could not do more strenuous exercise due to severe arthritis and past injuries; and despite that they wanted to keep moving and tai chi was within their realm of possibility. Many of the ladies who were formerly stiff and sore and crippled by arthritis and osteoporosis were now spry, agile, and once again able to enjoy working in their gardens, following several months of practicing tai chi. It also provided the crowd an opportunity to socialize, especially for those who live in more isolated areas outside of town. There are 108 different “moves” or segments in tai chi, and they are done from start to finish in a particular order. Since this class was intended for newbies, we learned only three of the moves today. But afterwards, the more experienced class members (about 35 people) stayed to do the entire segment, which takes about 20 minutes. How the heck they remembered the order, much less the intricacy of the moves themselves, is beyond belief. I’m lucky to remember more than two or three things in sequence, much less 108! I gave him my phone number and left the rest up to him. Fishing is a mixed blessing, a combination of patience and anticipation; horror and joy; morbidity and sustenance. I still don’t enjoy picking up a squirming worm. And despite those who say worms don’t have feelings, I know that cannot be so because I have felt its initial flinch and stab of pain with the first prick and then impalement onto the fishing hook. And then I must continue threading it on the hook, jabbing the poor worm again and again. Meanwhile as I’m perpetuating this cruelty, I am surrounded by clear blue waters – – so clear I can see 15′ – 20′ beneath my boat – – a deep blue sky with the puffiest, cotton-white clouds, and verdant mountains ringing a lake so private that I’m its only human visitor on this day. Disgust mixed with profound beauty. 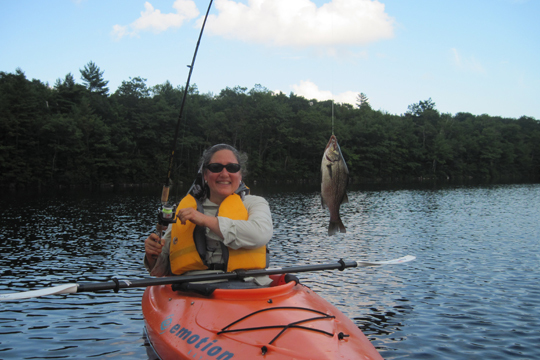 And then, while paddling silently, gliding along the glassy water with only the slightest breeze, my fishing rod stuck in its holder just behind the kayak seat, the line let out several tens of feet – – there is a small nearly imperceptible shudder and the rod begins to arc. I know it’s not because I’ve picked up some lake weeds or am stuck on a buried rock outcropping, because the line grows taut and then slack and then taut again with a staccato-like rhythm, and as I lift the rod and grab the reel and begin to wind, I feel the give-and-take, give-and-take, subtle at first, of the fish’s nibble. If I reel it in too quickly or too slowly, the fish will not catch properly on the hook, and he’ll swim away (and sometimes sneakily grab a few bites of the worm in the process). No, we have to do this dance of life and death, struggle and exhaustion, triumph and defeat. When I catch the fish and pull him out of the water, I see he is tired – he has fought hard both for the worm and from the hook and death. His gills flex in and out, as though he is panting, struggling to breathe. He lays very still in my net, but no, he has a second, and then a third wind, and fights the net, my hands, and evades my grasp as I try to remove the hook. Some of his fins prove to be painfully sharp – his only body armor of defense. He seems robust in girth but not in length. Alas, he measures approximately 12″ – not bad, but according to fishing regulations he must be at least 14″ if I want to enjoy him for dinner. Removing the hook, I let him float in the net that I’ve placed back in the water, allowing him to slowly recover from the stress of imminent death. I open the net and at first I wonder if I’ve waited too long – he seems too still. But no: he is suddenly re-energized and dashes back into the lake’s depths and freedom. “I will come back for you next year,” I tell him, “when you are yet bigger. And then we’ll see.” I feel sorry that I couldn’t eat him, because I don’t like the concept of “catch and release” for the sake of “sport” – it stresses and plays with an animal for “fun.” I want to experience the entire process of catching, killing, cleaning and eating the fish, because I want to appreciate life, death, and sacrifice. I want to know if I have it in me to kill. I am not sure that I do. I know I feel conflicted with regret and relief as he is released. Do we really appreciate the profundity of a fish’s sacrifice (“so that we may live”) and, for that matter, God’s gift of sustenance, if we buy a plastic-wrapped fish in the market, so far removed from its source? I continue paddling, and once again feel a nibble. Not as strong – I figure it’s the same dumb fish but he’s simply more tired – – but when I reel it in I see it’s an even smaller fish, only 9″ long, and I throw him back immediately. Fishing is kind of like gambling, I decide. It’s somewhat distasteful yet exciting. The odds are against you. But when you win . . .
There’s always the anticipation of a win, no matter how unrealistic. Nature, in this case, is the House, and as we all know, the House always (well mostly always) wins. But not enough to stop me from trying to beat the odds. I set out again. And again. Only the coming dark has the power to make me call it a day. 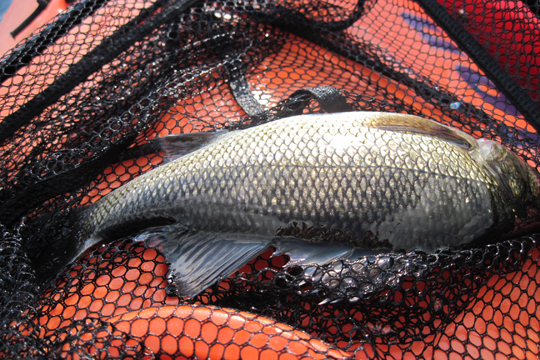 I’ve since caught land-locked salmon, perch, brown trout and bass. 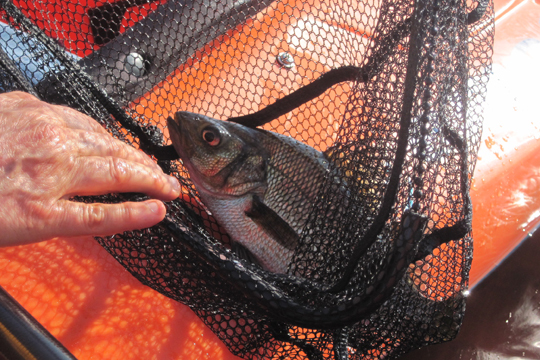 None were “keepers” – legally large enough to become dinner. It appears the only fish I will be eating anytime soon will be coming from a can. It’s funny, this late in my life, to see how fishing has suddenly cast its spell upon me. When a brown trout succeeds in sneakily nibbling the worm off my hook without getting caught, I see there are two ways of looking at it: I’m not going to let some stupid fish outsmart me! Or, maybe I don’t know everything and I have a lot more to learn . . . even from a small fish. It’s humbling. Thank you, G-d. When you live in a rural place and the nearest supermarket is 35 – 45 minutes away, you tend to have a lot of emergency rations stored in mouse-proof containers. You make a marketing list with a week’s worth of food garnered from a week’s worth of menus that have been thoughtfully planned. Although this may sound daunting (I seem to go nearly every day to my supermarket in my hometown, since I’m much less organized and it’s just around the corner), when you realize that it costs $10 in gas every time you make the trip, it quickly motivates you to become more sensible. But it’s not difficult for me to pop over to several nearby farm stands. All are located on private farms; some may be little more than a lean-to and others are quaint wooden buildings complete with a wide front porch. One has to wonder how it is possible for some of them to make a profit in today’s world of large-scale agri-industry. The answer appears to be diversify, diversify, diversify, even on a small scale, and become social-media savvy. 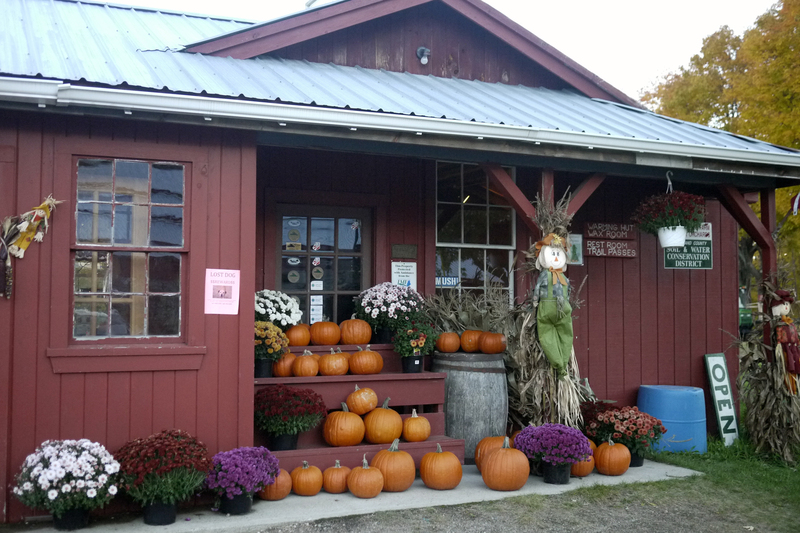 Most have websites and Facebook pages of their own, and one farm even had a Groupon with a 50% off coupon.There are farms that have children’s activities, hay rides, and special Halloween celebrations. 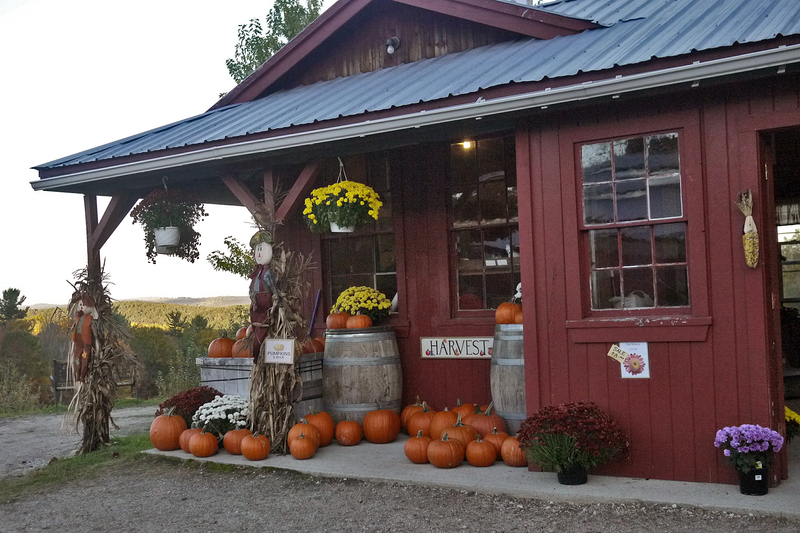 Some have full-fledged kitchens that whip up artisan breads and heavenly-smelling fruit and pumpkin pies and other baked goods. 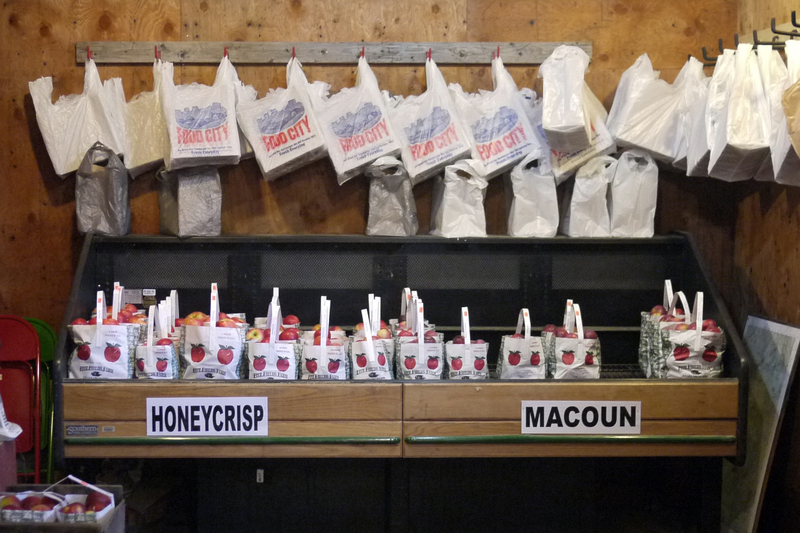 This time of year there is also fresh apple cider. 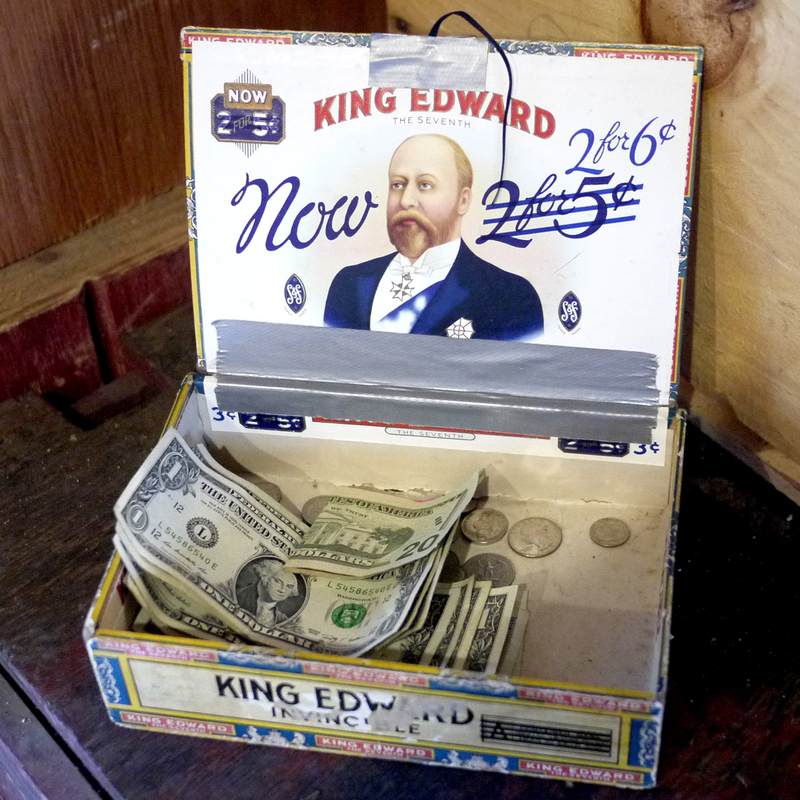 Usually the proprietor is too busy working the farm to stick around waiting for customers, so they leave a cigar box where you leave money for your purchases and you can make your own change. 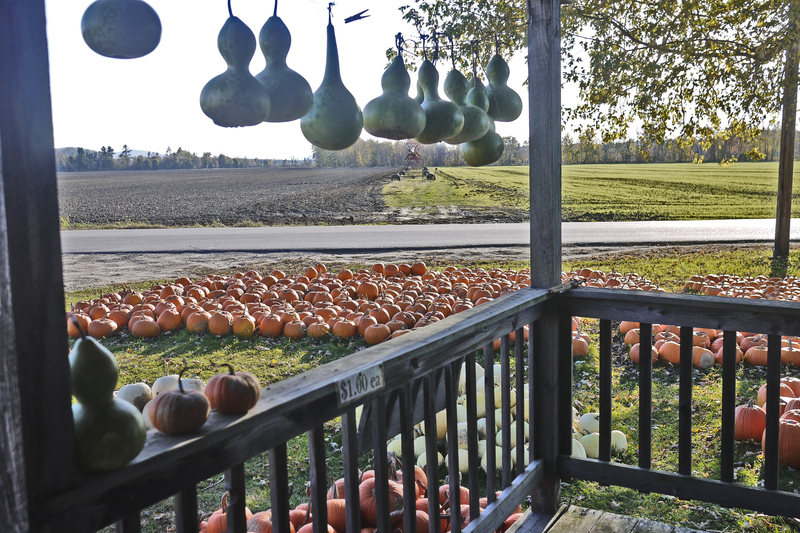 Some of the farms offer a pick-you-own option for apples and pumpkins. Yesterday I went to Five Fields Farm to see if they had any “drops.” When apples fall to the ground before they can be hand-picked, they may bruise slightly and lose market value. The “drops” are sold for pennies on the dollar, but they make great cider, applesauce, and are perfect for drying into apple chips with the dehydrator that my younger son and daughter-in-law bought me. (Actually I used the dehydrator for the very first time today. I made beef jerky from some pepper steak I had brought from my home town. It is delicious!). Last year I bought 150 lbs. of apples and made many, many jars of unsweetened applesauce which I gave away as gifts, but this year I don’t feel quite so ambitious. 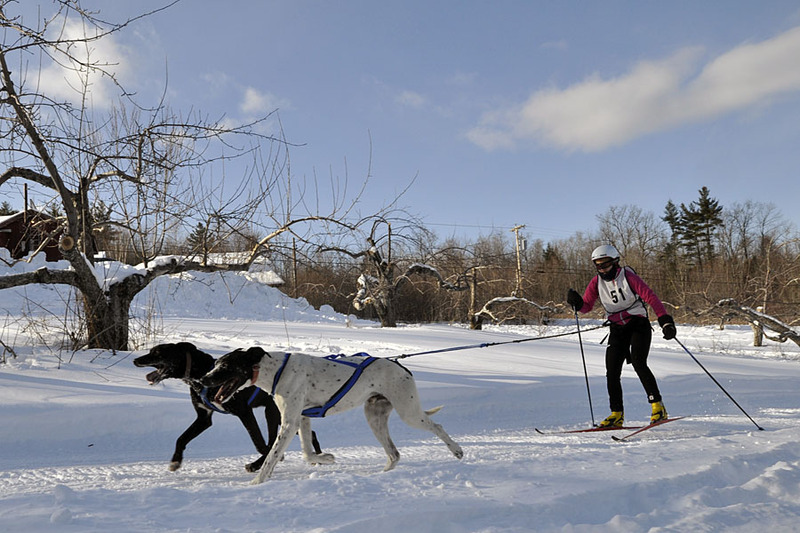 When their orchards lie dormant in winter, Five Fields Farm uses the fields for dog sledding and skijoring races as well as cross-country ski trails. 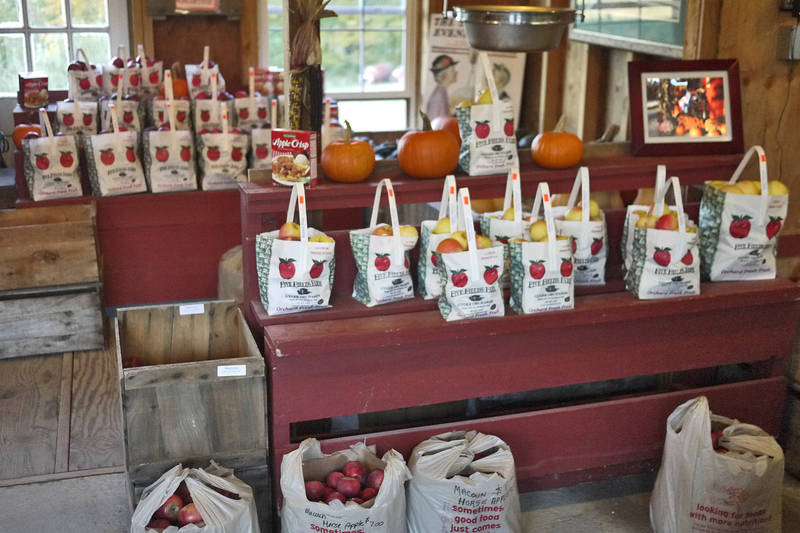 Today I went to Pie Tree Orchards where I bought some delicious organic Northern Spy apples. 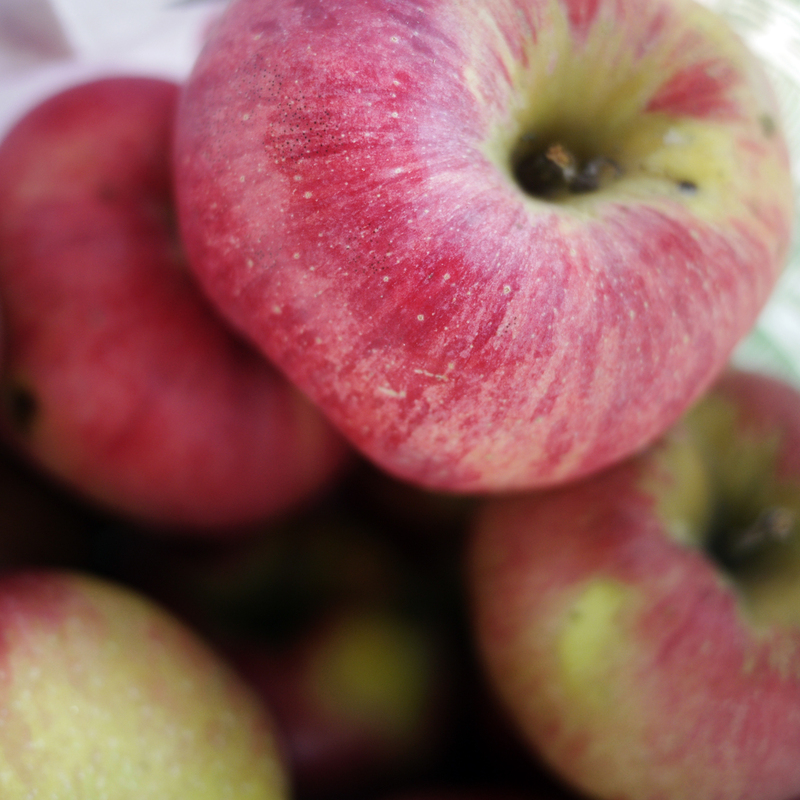 This “heirloom” apple variety is extremely cold-hardy (necessary for Maine winters) and originates in Maine. It’s rarely found outside of New England. It’s a hard, crispy, sweet-tart apple that is packed with juicy goodness. 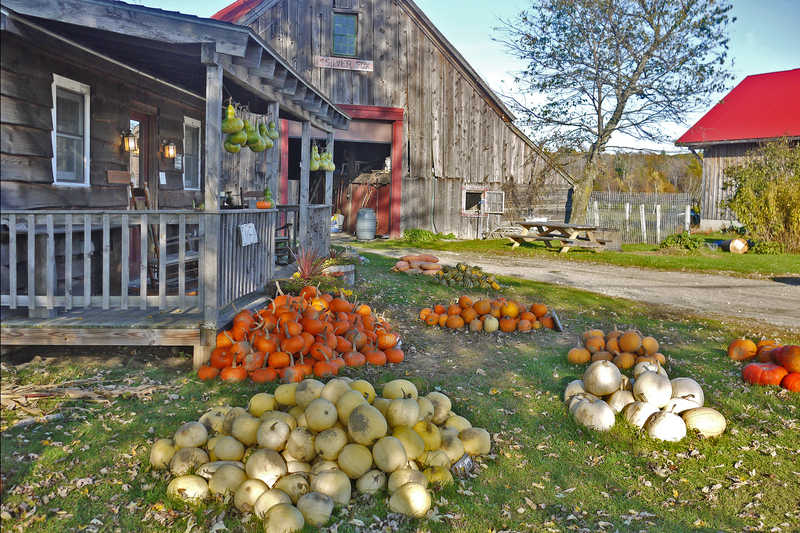 Pie Tree Orchards also sells many unique squashes and pumpkins, plus kale and various root vegetables picked straight from the garden. Does anyone know what kind of squash this is? If so please write in. 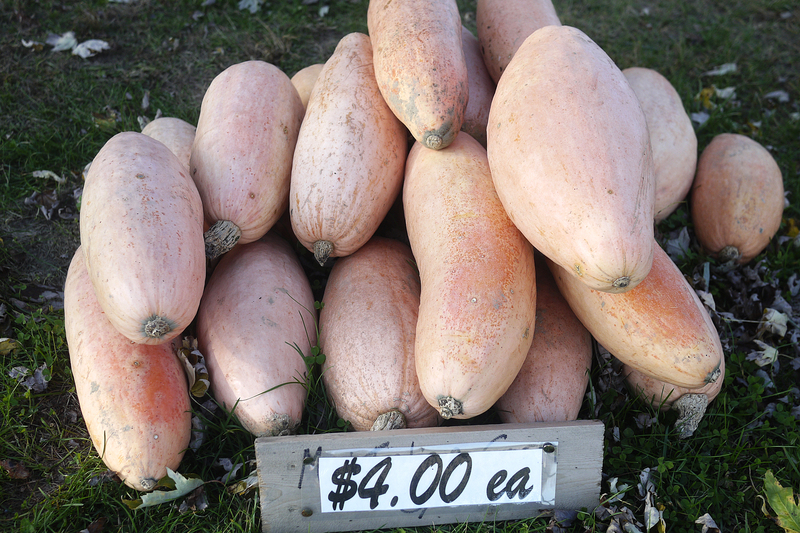 It’s salmon-colored, the same shape as spaghetti squash, but larger. 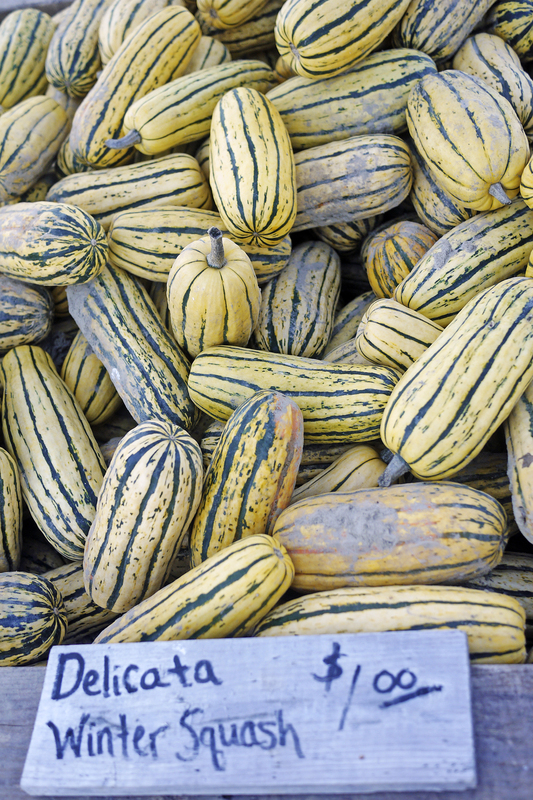 Delicata squash used to be hard to find, but due to its well-justified popularity, you might find some at your local supermarket or farm stand. If you do find it, grab it! It’s sweeter, creamier and more custard-like than butternut squash, and it will soon become your all-time favorite squash! Then there is Sherman Farm. 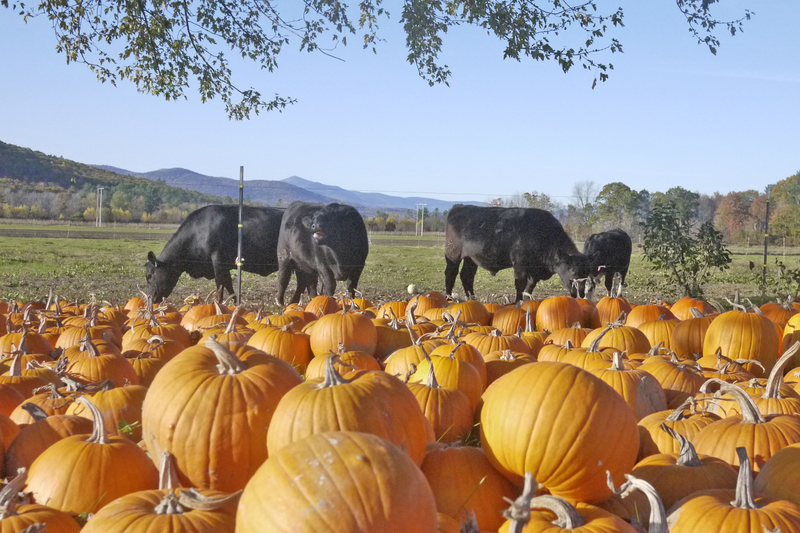 This is a large farm that is renowned for its milk, vegetables, and a 12-acre corn maze that has a different theme every year. 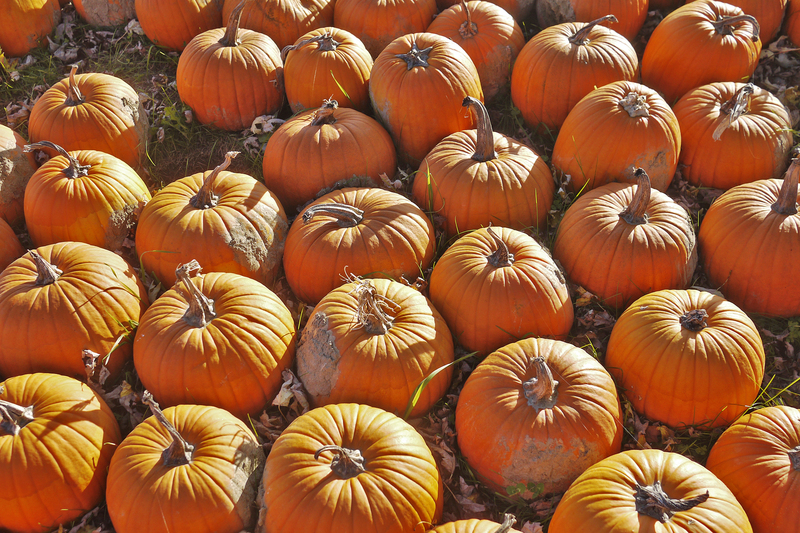 People come from all over New England to wind their way through their famous corn maize. Perhaps you are old enough to remember when milk came in glass bottles. Well, it still does at Sherman Farm! I’ve done a blind “taste test” of milk from Sherman Farm and the supermarket, and not only can I tell the difference; Sherman Farm’s milk is far superior. Sherman Farm also gives back to the community. During harvest season, volunteers descend onto the fields and pick hundreds, and sometimes thousands of pounds of surplus produce, which is donated to local food banks. The August 2012 harvest yielded 10,678 lbs of fresh surplus produce picked with a value of $27,910 and it served 15,617 meals! In the summer of 2011 during Hurricane Irene, the low-lying farm was flooded and lost the majority of its crops. The surrounding communities gave money, time, manpower and materials to help rebuild Sherman Farm. Today’s lunch was so colorful I just had to take a picture. 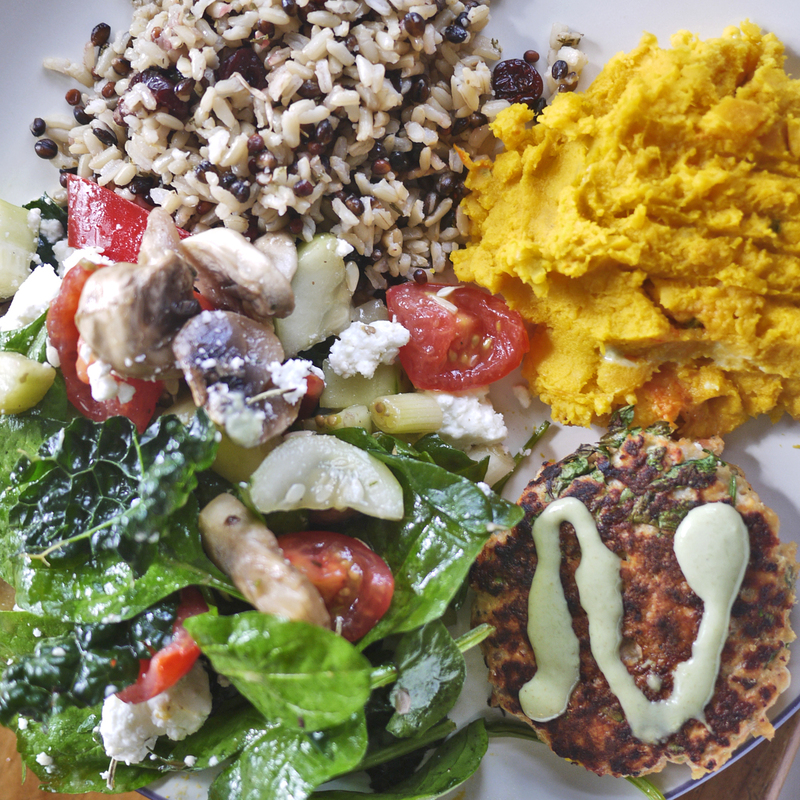 Clockwise from top left: 1/4 c. Trader Joe’s Wild Rice (to which I added toasted pecans, dried cranberries, rosemary and thyme); 1/4 c. mashed squash from the farm stand, with a dash of Maine maple syrup; salmon patty with a dash of wasabe sauce; and 1 1/2 c. spinach-kale salad with Israeli feta from Trader Joe’s, plus an olive oil vinagrette dressing. Yum!